Featured soloist at this year’s Christmas concert is Kevin Hickman current New Zealand Champion of Champions and principle cornet of Woolston Brass. Kevin started playing the cornet at the age of 9 in the Feilding Brass Band. At the age of 12 he was taken under the wing of Kevin Jarrett who tutored Kevin until he left Wanganui as a 20 year old. Kevin Then spent 3 years in England playing in the Hillingdon Brass Band, just outside London, under Philip Sparke. On his return to New Zealand Kevin moved to Christchurch and joined the famous Woolston Brass Band. 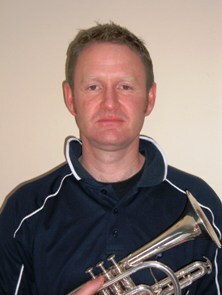 Kevin has been principle cornet at Woolston for the last 12 years. Kevin has been selected in 3 National Bands, won the New Zealand Open Amateur Cornet twice, been runner up in the Australian Cornet Championship twice, was placed 2nd in the New Zealand Champion of Champions in 1994 and this year won the New Zealand Championship Cornet and New Zealand Champion of Champions. Kevin has also been a member of many New Zealand Champion quartet’s, ensembles and duets. Kevin is an account manager for Christchurch printing firm Spectrum Print, and is married to Sarah, and has two sons Thomas 6 and Jacob 1.